Create PDF file from any document and image with three modes (default mode, image mode, text mode), precise control PDF page size. Support convert any segment of PDF to other files. Convert PDF to office document, TEXT, JPEG, TIFF, GIF and so on. Convert one multi-page PDF/PPT to one multi-page TIFF without losing any content, layout etc. Merge multiple images to PDF/GIF/TIFF without losing original style etc. Convert all pages of multi-page PowerPoint, TIFF, GIFF to PDF. Support convert each TIFF/PPT page to one PDF file. Save Word, Excel, PowerPoint, webpage of internet, html and so on to image. More, even save website of internet to image. Convert Office and Presentation document, Word, Excel, PPT, PDF, image to Flash video. 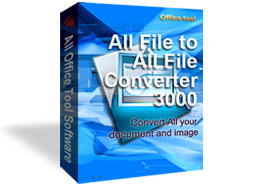 Convert Docx, Xlsx, Pptx of Office 2007 to your computer compatible Office 2000, Office 2003. Easily batch convert PowerPoint, PDF to vivid animated cartoon GIF. Produce multi-page tiff image from PowerPoint, PDF. Convert PowerPoint, PDF, GIF, TIFF to Flash Video with excellent quality. Convert any file to jpeg/jpg, you can set the image quality from 1-100. Directly convert webpage of internet or local html to any file format. More, extract the URL from some character strings. Convert PDF to HTML to make PDF indexed, available on the internet with preserve original layout, links, bookmarks, images, vector drawings of your pdf file. Provide user-defined HTML,URL framework settings for you. Capture the whole web page's content (including Flash) into GIF on the fly. Support resize the output file.